The ingredients synergy of Viazen Digestion is the key of the effectiveness of this SUPERIOR FORMULA. Specifically developed for the active consumer, victim of a high-speed lifestyle and who wants to relieve its bad digestion, with a natural solution, effective, simple, user-friendly and without side effects. An optimal digestion is essential to a general good health. CThese enzymes secreted naturally by the pancreas will complete carbohydrates, lipids and proteins digestion in order to reduce discomforts associated with dyspepsia. They will also improve absorption of the nutrients and will help eliminating tiredness appearing after meals. This plant has a tonic action on the entire digestive function and it improves the digestive process (mechanical digestion  digestive tract muscle movement and chemical digestion  succus secretion). It relieves nausea, vomiting and gas. This plant mucilage (polysaccharides) contributes to sooth irritations, to relieve mucosa inflammation and to protect gastro-intestinal mucosa by forming a protective coating. It helps to stop gastric and abdominal pains. This mineral is implicated in many enzymatic processes. It takes part in proteins, lipids and carbohydrates metabolism, and is an important factor implied in the tissues healing. * Daily dosage corresponding to 3 capsules of ViaZen Digestion. Microcrystalline cellulose, vegetable magnesium stearate, gelatine. Viazen Digestion is free of wheat, soya, corn, yeast, peanut, gluten, egg and dairy products. It does not contain preservatives, sweeteners, colouring agents, artificial flavours and is exempt of GMO. 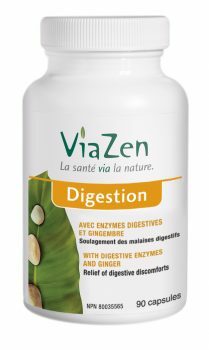 Viazen Digestion is recommended in presence of discomforts associated with a bad digestion. To relieve chronic problem, Viazen Digestion will be taken on a regular basis, which means at a rate of 1 capsule with every meal. The results will appear after a few days of treatment. Viazen Digestion can also be taken in a sporadic way, to prevent bad digestion in presence of heavy meals, alcohol consumption (wine, beer, spirits and liquors) and with late meals in evening or in presence of a lot of stress. The dosage will be of 2 capsules at the time. Be sure to ingest Viazen Digestion a few hours before or after taking other medication. Consult a health care practitioner if symptoms persist or worsen. Consult a health care practitioner prior to use if you are pregnant or breastfeeding or if you have diabetes, pancreatitis, pancreatic exocrine insufficiency or cystic fibrosis. Do not use if you are sensitive to pork proteins or to pancreatic enzymes. Nausea, vomiting, abdominal pain/epigastric pain and/or heartburn have been known to occur, in which case discontinue use and consult a health care practitioner. Bad digestion is associated to discomforts appearing after meals and resulting from an ineffective and incomplete digestive process. Also called dyspepsia, bad digestion impairs nutrients absorption because food particles are not divided into their simple expression. Their bulky size prevents them from crossing the intestinal mucosa, and then to be conveyed to the cells. In long term, this situation may likely generate nutritional deficiencies in vitamins, minerals, amino acids, essential fatty acids, proteins, etc. These nutritional deficiencies will lead to numerous health disorders, including anaemia, tiredness, headaches and the migraines. Moreover, these incomplete digested foods irritate the digestive mucosa. These irritations result initially in stomachic and abdominal discomforts. Present in a chronic and constant way, they can contribute to the development of digestive tract pathologies, including gastritis, ulcerative colitis and irritable bowel syndrome. The regular contact with irritating substances injures the intestinal mucosa, which risk to become leaky (imagine a fine sieve strewn with holes), letting entering uncompleted digested food substances. These may be at the origin of several health problems, including allergic disorders (urticaria, eczema, asthma, etc. ), autoimmune diseases (rheumatoid arthritis, ankylosing spondylitis, lupus erythematosus, psoriasis, multiple sclerosis, Crohn disease, etc.) and of toxinic overloads (acne, headaches and migraines). An inadequate digestive process is associated to dysbiosis (intestinal flora imbalance). In addition to causing diarrheas, constipation and gas, the intestinal flora disturbance is associated to a weak infection resistance. Digestion is a complex process which aims the absorption of the nutrients through the intestinal mucosa. This physiological activity requires the participation of several organs and is attending step by step during the food transit in the digestive tract, from the mouth to the small intestine. Mechanical digestion includes all of the mixing movements of the bolus, including chewing, food kneading in the stomach and segmentation, which means the back and forth movements required to make possible the mixture of food with the gastric juices. Mechanical digestion physically prepares food for chemical digestion. Chemical digestion allows large food particles degradation in nutrients. It is carried out by the enzymes secreted by small glands present within the digestive wall, and also by additional glands, including the salivary glands, the liver and the pancreas. In addition, the bile, secreted by the liver, has an important function in the chemical digestion. What does occur exactly when bad digestion happens? Bad digestion results from an inadequate digestive transit, which is too slow or too rapid, and mainly caused by insufficient secretions of digestive substances, including saliva, gastric juices, pancreatic enzymes, intestinal juices and bile. These anomalies generate intestinal fermentations and putrefactions and predispose to an intestinal dysbiosis (abnormal intestinal flora). They constitute a major impairment to effectiveness nutrients absorption. Bad digestion problems affect 25% of the population. Stress appears among the major elements related to a bad digestion. Bad food habits (eating rapidly, drinking a lot of liquid in the course of meal, eating desert at the end of the meal, etc.) also disturb the digestive process. The presence of infectious agents (a pathogen bacteria, a yeast or a parasite in the intestines) can also be at the origin of digestion disturbances. Lastly, several drugs (aspirin, anti-acids, non- steroidal anti-inflammatory drugs, anxiolytics, antibiotics, etc.) have side effects harming the digestive process. 3. Suarez F. Pancreatic Supplements Reduce Symptomatic Response of Healthy Subjects to a High Fat meal. Digestive Diseases and Sciences. 1999. Vol. 44. No. 7 1317-21. 4. Sarner M. Treatment of Pancreatic Exocrine Deficiency. World J. Surg. 2003. 27, 1192-5. 5. Camilleri M. Functional dyspepsia : mechanisms of symptom generation and appropriate management of patients. Gastroenterol Clin North Am. 2007. Sept;36(3):649-64. 6. Platel K et al. Influence of dietary spices or their active principles on digestive enzymes of small intestinal mucosa in rats. Int J Food Sci Nutr. 1996. Jan;47(1):55-9. 7. Shukla Y et al. Cancer preventive properties of ginger: a brief review. Food Chem Toxicol. 2007. May;45(5):683-90.